"Future Hearts" is the sixth studio album by American pop punk band All Time Low, released April 3, 2015 by Hopeless Records as the follow-up to Don't Panic (2012). The first single, "Something's Gotta Give" premiered on BBC Radio 1 on January 12, 2015. Every physical copy contains five of twenty collectible "polaroids". 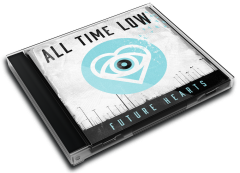 Deluxe editions of Future Hearts feature bonus songs, expanded artwork and an alternate cover.